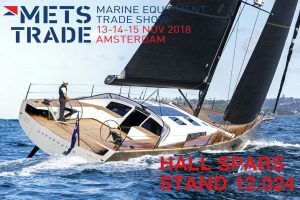 Hall Spars will once again be attending the METS Trade Show in Amsterdam next week from 13-15th November. On the stand this year you can find our Hall BV commercial director Andre Vermeulen, Hall BV general manager Jos van den Heuvel and Hall NZ managing director Dave Ridley, as well as many other sales and technical staff. This year has been an exciting year for the company, as Hall Spars continues to grow and take on new and innovative yacht projects. Our carbon manufacturing experience and expertise, paired with a desire to strive for the best, has translated into the excellence that we have today. If you want to see how our proven performance rigs can be a part of your next project, visit our team at stand 12.024 where we will be happy to answer any enquiries related to your rig and rigging needs.